A beautiful Camellia reticulate hybrid, Camellia Lady Pamela is not widely offered for sale, however it is a very popular plant with camellia enthusiasts. With typical large Reticulata type flowers, semi double, white with pink petal margins as the flower ages, this is a flower often seen on show benches across the country. This is a tall growing variety with an open growth habit. A mature specimen has an elegant look. Reticulata types are the tallest of all of the camellias and sometimes are grafted onto Sasanqua rootstock. 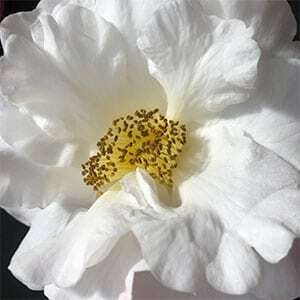 Being a large growing plant, Camellia Lady Pamela will require space in the garden. It is best grown in a proceeded position in a humus rich slightly acidic soil. A well drained soil that retains some moisture over summer is best. Mulch around the plant to maintain a cool root run and fertilise each year with a specialist camellia fertiliser. Height – Reticulata types can reach 8 metres in height over time. Not widely offered for sale.